I like bringing new products to hobbyists and this one is pretty cool. There’s been a complaint for years with bubble counters that you have to continually top up the solution as the water which they are filled up with, simply evaporates. If you have an external bubble counter that sits on the side of your tank, a half filled counter can look a little untidy. This is where AE Design Bubble Counter Fluid comes in. 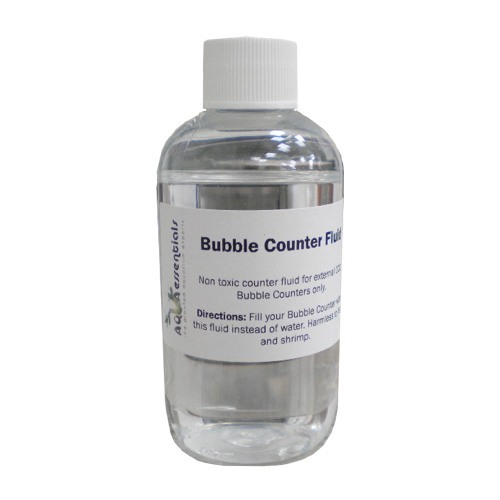 The non toxic formula is for use with external bubble counters only and does not evaporate. This means no more work for you and once you have filled your counter up, it stays filled up. In addition the other major benefit is the accuracy of this fluid. When using water, if you wanted to count 2 bubbles per second, it can be a little tricky. With the AE Design Bubble Counter Fluid counting bubbles is as easy as 1,2,3 :). The fluid is much thicker than water, making counting bubbles very easy. All in all a pretty useful product – don’t you agree? !